Students at The Grammar School at Leeds (GSAL) are celebrating their best ever GCSE results in the top grades, with more than a quarter achieving the highest possible grades. Twenty-six per cent of students clocked up the highest grades of A/7 or above in every subject, including five who achieved a clean sweep of eight A*s and two grade 9s each. Nationally 2.2 per cent achieved grade 9 in English language compared with 14.5 per cent of GSAL candidates, almost seven times the national average. In English literature 20 per cent of GSAL passes were at grade 9 compared to 3.2 per cent which is more than six times the national figure– a stunning achievement. 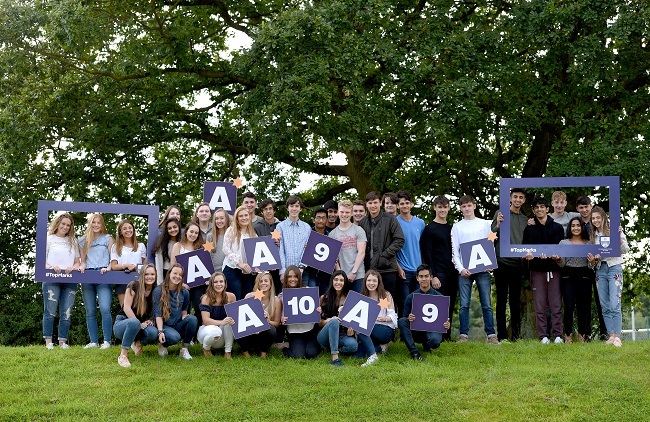 In the first year when new numerical grades replace some of the letters, 42 per cent of the grades are at A*/8 or above, giving GSAL its record-breaking year in the face of national predictions that top grades would be harder to achieve. The numerical results are in English language and English literature, with all other subjects graded in the traditional A*-G format, including maths at GSAL where the more rigorous IGCSE is already studied. As well as record results in the top grades, the school achieved its second highest results in the last six years with 69 per cent of all grades at A/7 or above, and its best results since 2011 with 98 per cent of passes at C/4 or above. Principal Sue Woodroofe said: “I could not be more proud of this year’s GCSE students. They are the first to have studied the new English language and English literature courses and other GCSE subjects with more challenging course content and they have performed brilliantly. To have achieved 14.5 per cent and 20 per cent passes at grade 9 in English language and English literature respectively is truly amazing. “These GCSEs are the toughest since the change from O-levels and our results testify to the outstanding achievements of a wonderful group of year 11 students and promise much for their A-level futures.